The White House and Federal Bureau of Prisons did not respond to requests for comment. “We know that inmates and their families are particularly interested in the changes regarding ‘good conduct’ time. 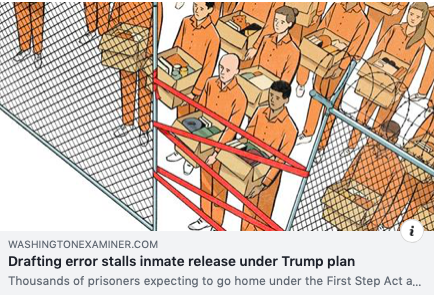 While changes in the First Step Act may result in additional credit for inmates, we note that the changes are not effective immediately nor are they applicable to all inmates,” Hornbuckle said. For people in prison, the delay is a major blow. “He’s ready to come home,” said Veda Ajamu, whose brother Robert Shipp, 46, has served 25 years and expected near-immediate transfer to a halfway house or home confinement, as is typical toward the end of sentences. “We’re talking now 25 years, 4 months, and 10 days for him. It makes me really sad, because I can’t do anything. For a person who’s been in prison so long, that’s a hard pill to swallow,” Ajamu said. Charles “Duke” Tanner, who has served 14 years of a 30-year sentence, does not expect to get out immediately but said other people are anxious to leave. 46 queries in 0.282 seconds.